The report/campaign statement must be closed in order for it to be submitted electronically. Once a report/campaign statement has been closed it can not be unclosed without the assistance of technical support. Corrections made after a report/campaign statement has been closed must be submitted as an amendment. Select the Reports tab, then select the specific campaign statement that is to be electronically filed and right click to select Close Report. Enter the information for the date closed, time closed and date signed. Both dates should be the same. 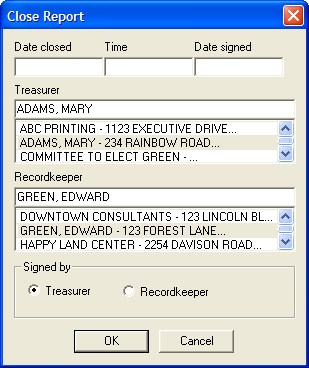 If there is a treasurer and/or a record keeper select the appropriate name from the drop down listing. Once this process is complete a lock icon will appear for the specified report. Once a report/campaign statement has been closed it is now ready for submitting electronically over the Internet or via disk. Select the Upload icon on the toolbar or select the File menu then select Upload to begin the uploading process. When the settings screen is presented the first step to be completed is the entry of the upload screen. Enter the unique upload password assigned to the committee. Please note the password should be entered in all capital letters as it is case sensitive. 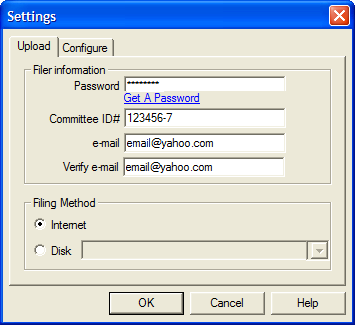 To obtain a password or if a new password is select the link �Get a New Password�. Enter the committee identification number. Enter the committees email address to receive a confirmation of the report being received. Enter the committees email address a second time for verification. 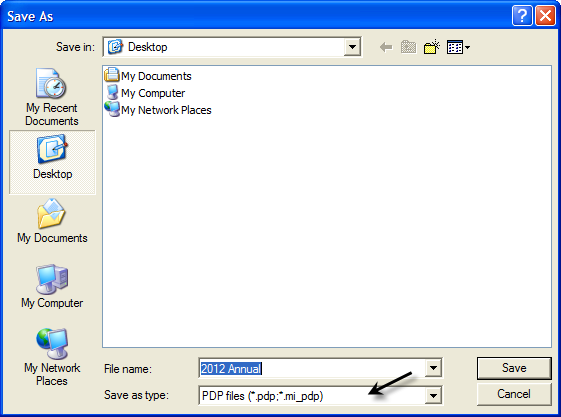 Select the filing method as Internet. Select Ok to run the report/campaign statement through the validation. Once the filing has been received a confirmation message and a sequence number will be emailed to the email address provided. Save the sequence number to document the successful uploading of the report/campaign statement. Under the File menu select Upload to begin the uploading process. Select Disk from the bottom of the upload screen. Select the appropriate drive and insert a blank disk. An onscreen message will be received to indicate either the campaign statement has been successfully loaded to the disk or it failed to load. If after several unsuccessful attempts contact the MERTS helpdesk for further assistance. Properly label the disk and mail to the Bureau of Elections. After successfully filing the campaign statement be sure to click the ‘Save’ icon to prevent losing new data.